Having taken part in many evenings at Lord's Cricket Ground, The Pub at Hambledon and elsewhere, all celebrating the music and poetry of cricket, under the watchful eye of cricket historian and ex-BBC Producer, David Rayvern Allen, it seemed crazy not to commit some of this material to tape. 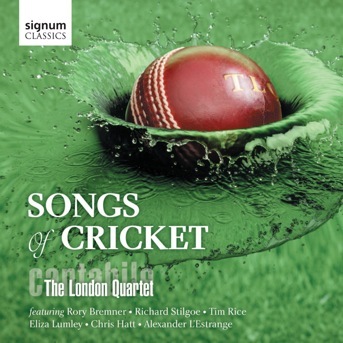 Signum Records agreed to release this cricket disc and Songs of Cricket was born. Just a few of the many pieces possible are here, but along with wonderful guests, The London Quartet cover centuries of cricket music. Eliza Lumley - the West End star sings two solo songs and also a duet about Andy Flower! Mainly accompanied by the Musical Director of Billy Elliot, pianist Chris Hatt (and he does a piano solo too). An unmissable CD for lovers of cricket ... and everyone else as well!